These are my hub's favorite cupcakes. The cake is wonderful chocolate that is hollowed out so it may house bits of Snickers candy bars melted in a homemade caramel sauce. 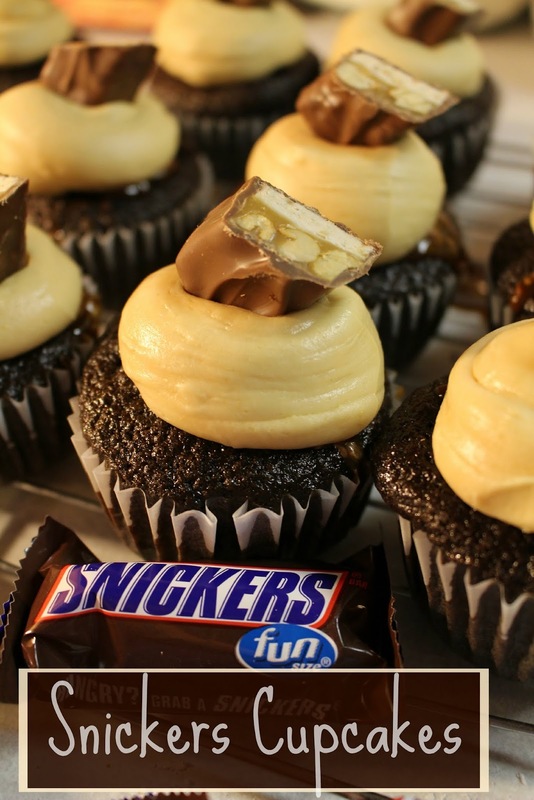 Then...they are topped with a big fluff of caramel frosting and half of a fun-sized Snickers bar. I don't think the little candy bars are really "fun", but whatever, that's what they are called. Fun to me is more like the king size? Okay, well these are pretty amazing cupcakes that will steal your heart with your first bite. Well, maybe I'm being a bit dramatic, but I totally mean it. I've made these so many times that I have it memorized. Although, I always use my favorite chocolate cake recipe (Hershey's Chocolate Cake) and make the caramel that I always make, which is super simple. So, perhaps it isn't too hard to memorize. I came across this recipe about two years ago over at annies-eats.com, and can I just say that she has some amazing recipes on her blog. You can play around with the chocolate cake recipe that you use. There is several steps to this recipe, including making a caramel sauce - which to me is no science, I base its readiness on how it looks. The time spent on this recipe is well worth it and you will not regret it. You will only regret the calories. Please do not count those. I have updated this recipe to show pictures step-by-step of the caramel sauce while I am making it. It isn't hard to make, but people have sent me questions asking, "How do I know it is done?" Watch the stages the butter and sugar goes through. It bubbles, boils, darkens, then smooths out to a glossy caramel color when it is ready. Until then, some of the butter just hangs out on the surface, not quite absorbing the sugar yet. When it gets to the last photo ^^^^ add the heavy cream and whisk until combined. Reserve some of this completed sauce for the frosting. Let them swim in the caramel, getting all cozy and melty. Pipe on a generous amount, then top with a cut Snickers fun size bar. This recipe will yield you 24 cupcakes. This is my slightly adapted version of the Snickers Cupcake. Combine together the sugar, cocoa, flour, baking powder, baking soda, and salt. Add the eggs, vanilla, oil, and milk. Fill paper-lined cupcake tins 1/2-3/4 full of of the batter. Cook 10-12 minutes, until bottoms are no longer wiggly. In a medium-sized saucepan over medium heat, add the butter and sugar. Stir constantly with a wooden spoon. Stir mixture until it bubbles and you start to see it turn a rich caramel color. It takes about 7-9 minutes. Either remove from the heat to add the heavy cream, or do as I do, and reduce the heat to low, and stir in the cream very slowly. The mixture tends up bubble up and harden on me if I remove it from the heat completely. The sauce will thicken into a delicious caramel sauce. I haven't read the temperature during this step - it is all how it looks to me and it starts to smell...cooked. Remove from heat when it is all mixed and add the vanilla and salt, stirring constantly. Remove 1/4 cup of the sauce for the frosting. Mix in the chopped candy bars and combine until the candy is gooey and covered in the caramel. Using spoons, fill the hole in each cupcake with the caramel sauce/candy bar mixture. Mix the 1/4 cup caramel sauce, butter, heavy cream, vanilla, and powdered sugar (adding 1 cup at a time) until you reach the desired consistency. I like mine softer, a little fluffy. Pipe onto the cupcakes however you desire. I like to use a round #10 or #12 tip to get a big round blob on the top. Garnish with the extra candy bars as you wish. You bake for a living? Now I understand why I like your recipes so much. So I stay at home, watch some kids, bake, and blog about it! p.s. I am glad you stalk my blog haha!